A group of Serbian intellectuals have written a new letter condemning the charges against the six anarchists being persecuted by the state. On November 3, 2009 , the supposed throwing of two burning beer bottles at the Greek embassy was qualified by the Public Prosecutor's office as a crime from the list of the most serious offenses. Six proved antifascists are thus being accused of no more and no less than international terrorism! A group for monitoring the trial against the six anarchists has initiated a petition, collecting signatures under an open letter that aims to bring to public attention the fact that what we are faced with is a political trial. The text of the letter has been supported by numerous intellectuals. 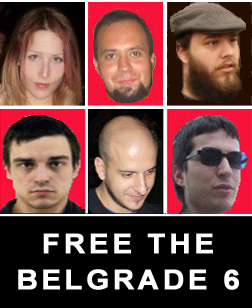 On 3rd and 4th September 2009 Ivan Vulović (24), Sanja Dojkić (19), Ivan Savić (25), Ratibor Trivunac (28), Tadej Kurepa (24) i Nikola Mitrović (29) were arrested by the police. They were arrested on suspicion that they may have perpetrated the criminal act of causing general danger by throwing “Molotov cocktails” at the Greek Embassy. 24 hours later the state prosecutor' office changed the police qualification of the supposed act from “causing general danger” to the “criminal act of international terrorism”. We fear that this was an arbitrary interpretation of the Criminal Code and a case of its use for political purposes. It is necessary to state the social context in which all this is happening. Historical revisionism is becoming more and more normalized and legal rehabilitation of nazi collaborators from the II World War are on the agenda. Equalization of leftist and far-right political ideas is a consequence. Just in the year 2009 we have witnessed the escalation of violence (as a consequence one foreign citizen was killed) and numerous threats with violence were made by the fascist groups. All of this was met with a mild reaction from the state prosecution and the police. To name just one example: in the days leading up to the Pride Parade the threats of physically liquidating the gay population were called just “polemics” by a representative of the state. The state has created a situation where a confrontation with the same violent right-wing groups that it initially embraced, but with whom the relation has long since metastasized, seems unavoidable, At the same time, the state finds its scapegoats on the left, penalizing it with draconian measures to establish an illusory quasi-balance and present itself state as “fair" in opposing two equally dangerous extremes. We live in a state where there is no guarantee that a person will be prosecuted for his or her promotion of racial, religious and national hatred. In all these years, members of the clero-fascist organisation Obraz (operating without problems since 1993) and the Serbian nationalist movement 1389 (which presents itself as “patriotic” while maintaining close contacts with Russian fascist organizations) have not been held criminally responsible for their acts which involved threats against the LGBT population and numerous attacks and beatings of their members! The leader of a nazi organization “Nacionalni stroj”, Goran Davidović, (“Fuehrer”) was allowed to openly mock the legal system of Republic of Serbia, when he succeeded in his complaint against the guilty verdict in his case, basing it on the fact that documents of the trial were written in latin letters. We also need to remind ourselves of the fact that in the Criminal Code of the Republic of Serbia the act of international terrorism is listed together with genocide, crimes against humanity, war crimes against the civilian population, the organization and incitement of genocide, war crimes and agressive war. We live in a country, that for decades now has been governed by national-chauvinistic discourse and where even today it debated whether or not there was a genocide in Srebrenica, or whether mass war crimes in Kosovo even happened. The readiness of the prosecutor's office to qualify two thrown beer bottles in the same way as the most horrific crimes known to humanity represents a devaluation of these crimes and is a symptom of the deeply degenerated system of values that made it possible. On the night between 23rd-24th October R.K. (17), N.H. (18) i I.F. (19) were arrested in Vršac. The reason for their arrest was that they had been pasting posters with “Freedom for the Arrested Anarchists” written on them. A criminal case was initiated against these young people as they are being accused of “obstruction of justice” (Article 336b of the Criminal Code). They are threatened with three years in prison if found guilty. Despite the fact that the stated intention for initially introducing such a paragraph into the Criminal Code was the fight against right wing extremism, what we again see is a crackdown on the left. We think that the reason that a political indictment of this kind could even be produced lies in the influence the political parties have on the representative and judicial branch of the government. (One example is the fact that judges are re-elected by the High Council for legal Affairs, whose members are nominated by the parliament). The Venice Commision at the Council of Europe and the European Commision have both already pointed out that this arrangement is controversial. Taking into account Article 10 of European Declaration om Human Rights, we do not hesitate to openly state that all the circumstances of this case clearly lead to the conclusion that in its essence, the trial against the six young people is a political one. This is why we demand the the withdrawal of this senseless indictment.